Hello! Greetings from Pensacola Beach, Florida! Sorry for my absence all week, but I've been vacationing on the Gulf Coast, and even though the weather hasn't been the best, I've been having the time of my life! It's only been in the 50's and 60's all week, and one day it was as cold as 45! So it's been a challenge trying to decide what to wear everyday. 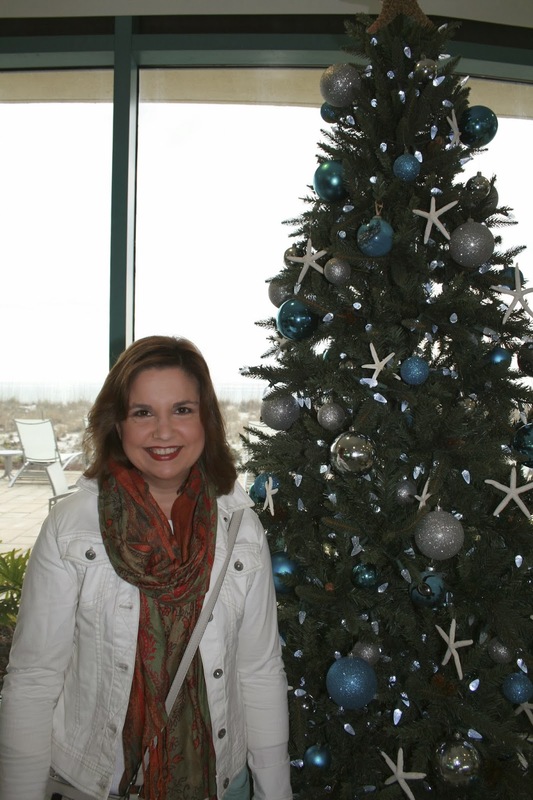 Thankfully, I brought lots of scarfs, light weight sweaters, and a couple of jackets to keep me warm; which brings me to my topic: what to wear in a beach community in the middle of winter. 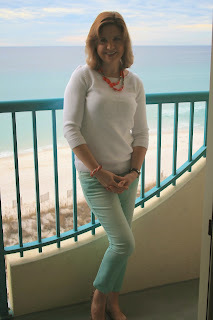 Well, even though the weather was cooler than normal, I wanted to dress using the muted, cool, tropical colors you normally see in the Spring and that are also used in interior and architectural design in tropical climates: so I packed lots of teals, corals, whites, and blues into my suitcase. 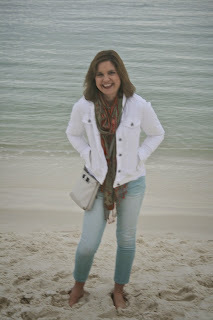 The first day of our vacation, this is what I wore: teal ankle length skinny jeans, a white nautical sweater, leopard print flats, a white jean jacket, and a scarf that had all the colors of my outfit in it. I carried a cross body tan purse for security reasons and also because it was small and lightweight to carry only the essentials. My jewelry was a coral beaded necklace and bracelet. Can you see the anchor on my sweater? I found this classic sweater at Talbots when I was vacationing in New Hampshire last August. 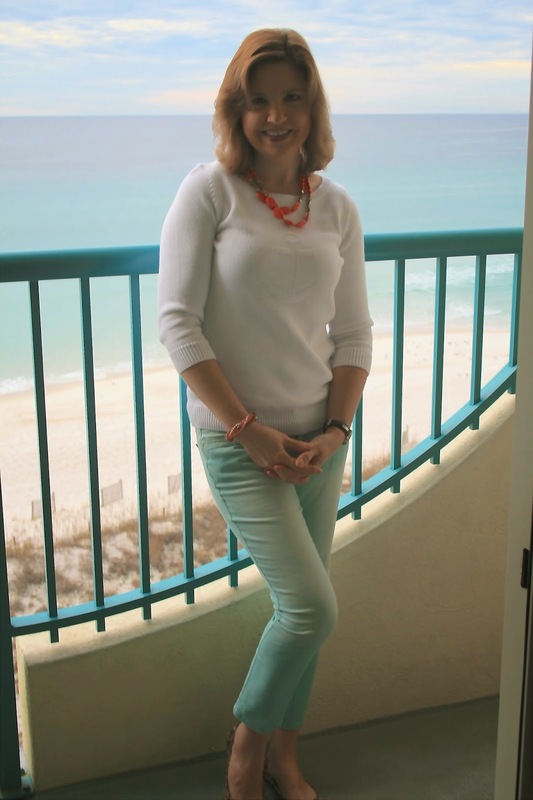 This is the full outfit: Our hotel was right on the beach, and this was the gorgeous view I got to wake up to everyday. The hotel had the cutest Christmas tree decorated in a nautical theme in the lobby. I just loved it! Well back to the frozen waste land of Wisconsin tomorrow. It will be so hard for me to leave this place. I would love to live in a beach community like Pensacola. Gorgeous photos Amy! Love the colors of your outfit, and yes, what a view to wake up to every morning! Sorry you have to be back in the freezing north! It's bitterly cold in IL, probably worse in WI. Stay warm!! Great outfit Amy, looking good and so is the beach in the background!